Sally Townley has announced that she will now run for Coffs Harbour in the upcoming NSW State election, but not as a Greens representative, as an independent. 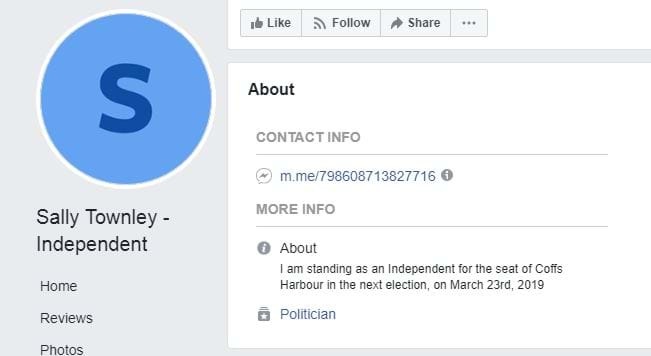 On Friday afternoon, a Facebook page for Ms Townley appeared briefly saying "I am standing as a independent for the seat of Coffs Harbour in the next election, on March 23rd, 2019." The Coffs Harbour City Councillor had planned to campaign in the Federal election as a candidate for the Greens in Cowper, however has decided to withdrawn her candidacy for the federal division. Ms Townley said she felt she would regret not contesting the seat with the retirement of Andrew Fraser after more than 28 years. Earlier this week John Cassell announced he would join the election race representing the Greens for the seat of Coffs Harbour in March.